Overdue Obituaries: History has forgotten them – until now. Liv was a complicated woman. Proto-feminist, poetess, laundress, Livian (“Liv”) Upsheizer escaped her meat before, as her uncle said in an interview in the literary journal “Animal Grooming,” “she reached her full potential. Had she lived another 20 years, there’s no telling how many poems she would have written, or horses she would have shaved.” Her self-published autobiography, To the Bathroom Born, was never sought after by collectors. 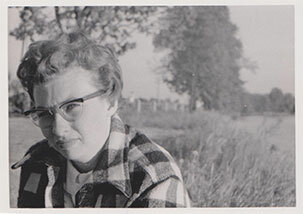 As a young girl growing up in North Dakota, she often found herself alone. Her parents would disappear for weeks, trapping squirrels and gambling with their pelts across three states. By the age of 6, Liv could shave an entire horse by herself. By the time she was 10, she realized her parents weren’t doing anything for her, and she was tired of waiting around for them. She had learned where food could be found all around her – sweet nettle, black thrush, orianderaderodder, and a tuber whose taste she would crave in her later years, purple mountain muscly potatoes. Her resourcefulness pulled her through and she was soon an apprentice to an apprentice in the clothing sanitation industry. The apprentice to whom she was an apprentice was called to duty so Liv moved up, but she soon became more than a laundress – she learned to repair the newly invented, gas-heated mangle and plug holes in washing tubs. She could split a log and break a trestle and hang a hog as well as most men. She understood what it was like to take care of herself. She published 15 volumes of poetry – including The Shunter is the Shunted, Long ago and Next Door, What the President Saw, and The Mouse. These books sold in the dozens, remarkably well for their genre, but few copies remain. Liv’s life was, not surprisingly, ended by a swift and well-placed equine kick while she was stropping a razor. Jode Meesum, holding hot dog. A right-handed man in a left-handed world, Mr. Meesum shook himself free from life just thirty years shy of his 80th birthday. As a boy, it was said he drove himself crazy by keeping flies in his ear canal. An unknown fever took him not long after he gave the world the egg cup cup, which caught the overflow from the popular, petite serving vessel. He is survived by the population of planet Earth. The town of Old City lost a man with terrible credit but a regular-sized heart. He was known for giving it all away, and then asking for it all back. “Barry” spent more time than he should have learning to interact in polite society with an increasingly high tolerance for alcohol. He would come screeching down the main street in his automobile an hour before sunrise, which the town resented, but he was also violent, which the town was afraid of. He was all about the tchotchkes: shot glasses from the contiguous states, dish towels featuring tasteless jokes, but his favored piece was the replica of a bathtub carved in wax from memory and in haste after the sculptor visited the incredible toilets at Touruche. To the town’s relief, Barold was lost to the ocean in a perfectly normal boating accident. “Anyone can fall over the side of a boat,” the deputy mayor, who accompanied Barold on the fateful journey, is said to have stated when he returned to shore before breaking out the champagne. Barold’s aunt insisted on donating his useless collection to the town archives, where it was cataloged before being thrown away.